1. Download the binary here. All you need is the Official Windows Installer – if you have trouble running 0.6.1 on Vista, please download here: http://dist.opensimulator.org/OpenSimulator.v0.6.2.8068.zip, extract to a new folder and run Opensim.exe. 2. Run and install the .exe file. 3. Start Opensim (open the program menu and click on the icon). 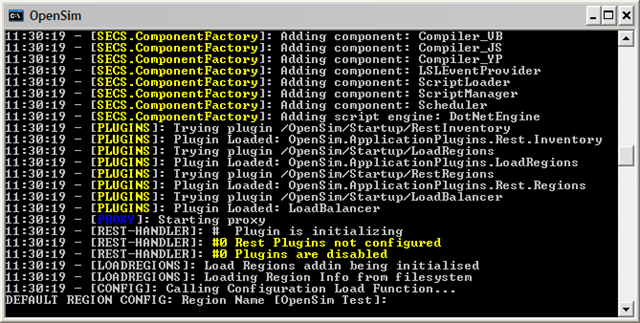 This will open a command window which will scroll through a few things as it loads. 4. You’ll then be prompted for the name of your starting region. If you want to keep the default value just press ENTER, otherwise replace it with the name of your choice. 5. Press ENTER to just set all the default values for the next few prompts UNTIL you see DEFAULT REGION CONFIG: First Name of Master Avatar [Test]: You can just choose the default value here as well but I chose to enter my own av name. After pressing enter it should prompt you for your last name, fill that in as well and press enter. 6. You’ll be prompted for your password. The default is “test” and again you can change it however you wish or stick with the default. 7. Press Enter and wait for everything to finish loading. Voilà, the sim is running and all you need to do is log in. The entire line should read: “C:\Program Files\SecondLife\SecondLife.exe” -loginuri http://127.0.0.1:9000/ -loginpage http://127.0.0.1:9000/?method=login -multiple. Press Enter. 9. Log in with the login info you specified during setup. If you want to transfer all the items – shapes, textures and the like – that you created yourself so you can have all your resources at hand you can use Second Inventory. I haven’t tried it yet so that isn’t covered here. But with this very basic install you should be able to upload textures, animations and sculptmaps and tweak them to your heart’s content, then upload them to the main grid when it’s back to normal. You can also just save your shape values from the main grid and set the sliders manually so clothes fit properly. To run on Windows Vista, you must first disable Windows Firewall. Under the new “Start” button of Vista, select “Control panel”. Then double-click “Windows Firewall”. In the window that pops up, on the left column, select “Turn Windows Firewall on or off”. You will have to give permission for this to run, then select the option “Off (not recommended)”. Click “OK” and exit from the Windows Firewall window. If you have McAfee SecurityCenter, see the description below. Once all the security features are disabled, right click on OpenSim.exe and select “Run as administrator”. This will pop up a window asking permission, select “Allow”. Your OpenSim server should run in a DOS-like window and accept connections. Note: You may need to install Microsoft .NET framework. Click here to download and install. If anyone has a tutorial for Mac or Ubuntu feel free to comment and I’ll link them here. Thanks goes to Vaalith Jinn for suggesting that I try this and to Codebastard Redgrave for feedback on running it in Vista. Have fun! This entry was posted on January 19, 2009 at 1:26 am	and is filed under Guides. Tagged: logins failed, Opensim, second life. You can follow any responses to this entry through the RSS 2.0 feed. You can leave a response, or trackback from your own site. Thanks for the great “how to” Caliah! It’s unfortunate that LL hasn’t provided a stand-alone version of SL. What we need is stand-alone version of SL, that can be run on a laptop and offers secure (IP/DCMA-compliant) synchronization with a target Sim and/or user account, giving people in the field a virtual 3D presentation system on steroids! Perhaps this concept of a next generation “3D/Virtual PowerPoint” will be attractive enough to get Microsoft to commit to delivering it on a Open Sim, SQL Server-based platform in 2010! I’d like to log with my friends. To have people connect to your sim, forward port 9000 (TCP and UDP). Make your external IP address is your IP address. Tell people to configure their SL viewer to access http://yourip:9000.
yay! ❤ it’s much fun to run to test skins, scripts or anything for that matter when the grid is borked. kudos for this tutorial Cal! I found a guide to setting up OpenSim on OS X here which is a little out of date. I’m going to try it out and see if I can’t piece together something a bit more user friendly. I posted a video back in November about doing this (which I think Valiant might have seen) but mine predated reliable binaries so it includes compiling your own, which I admit might not be for everyone. Might be somewhat useful to compare or make sure you always get the latest. Perhaps we should do another version of a video tutorial which uses the binaries. Sure Mo, if you do another for the precompiled ones I’d be happy to append the link to this post! I got it working on my desktop but all my prims seem to be phantom. Would you happen to know how I can fix this? whenever possible, please update my blog in your blogroll. My blog is no longer being update on blogspot.